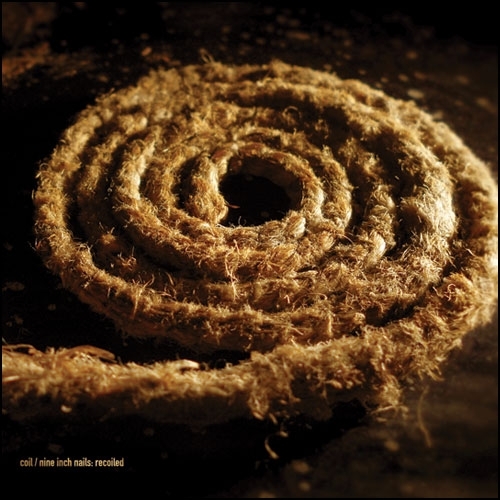 "Gave Up (Open My Eyes)"
"The Downward Spiral (A Gilded Sickness)"
"Recoiled" is a rambunctious alchemy, of magikal Coil sensibilities and hi-tech home circa 90’s mixing technique, all fused in the cave-like early studios of Danny Hyde (Coil, Electric Sewer Age) / Peter Christopherson (Throbbing Gristle, Coil). These were the unrestrained PRE- BIG studio- mix downs, of four songs which long time Coil admirer / collaborator Trent Reznor requested Coil to remix. Reznor sent over the original multi-tracks and DATs to Hyde / Christopherson, who independently mixed versions and then met to synch both creations, molding them into these master versions. "Recoiled" includes a fuller, more opulent version of the track "Closer", which eventually made it onto the opening credits to the movie "Se7en". These 5 lengthy compositions (just under 40 minutes) are pre-Ableton / laptop generation type priest song creations, with the use of baby alarms and numerous wires to create bespoke effects. These legendary tracks were always rumoured to exist and, only the due diligence of a dedicated NIN forum who hunted them down, are released/unleashed for your listening pleasure. 4 of the tracks were released on the download-only "Uncoiled". A bonus, previously unheard track from the same sessions closes the album. Jhonn Balance is also manifest on this gilded constellation. Beautifully remastered.